All four birds continue to be regularly visible around St George’s, though some (or all) are also absent for periods as the juvs explore the area and improve their flying skills. This can be seen in the company of one of the adult birds at times, with some aerial sparring as they learn the basics of hunting techniques. With a decent view the juvs can be easily separated from the adults by their buffish underparts and the pale blue around the eye and the base of the bill (bright yellow in the adults) – most of these features can be appreciated on the photo below, taken in the sun of Tuesday morning. 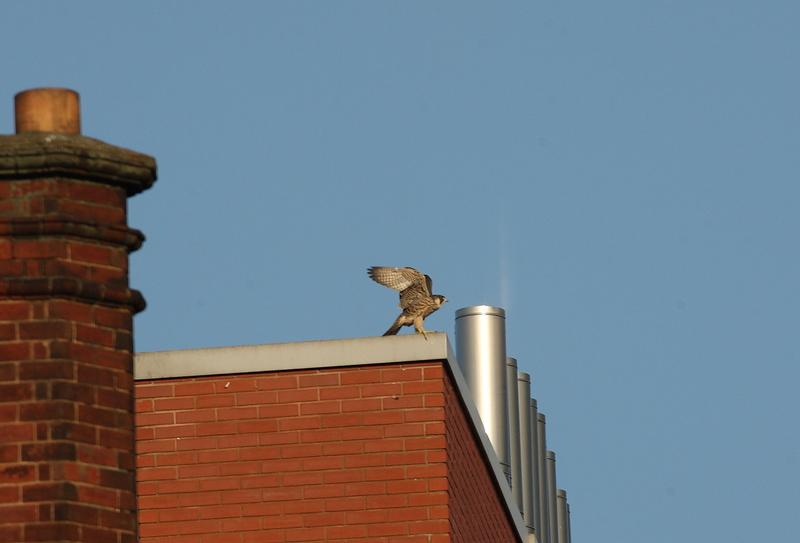 The juvs can also be seen on a variety of university buildings, with a preference for the Bio-incubator and the Jessop Building, as well as the top of the Arts Tower: the view from there must be great! A report of one of the birds being grounded in the heavy rain on Thursday caused concern, but there was no sign of it later so it is hoped that it managed to get airborne again without incident: a reminder that they still have some way to go until they can be considered to be safely independent. The weather has again been disappointing for much of the week, but with a little perseverance between the rain some terrific views can still be had as they behave and interact in ways that are rarely so accessible. Make the most of it when the sun comes out! The last few days have seen things calm down a bit after the excitement of the first flights for the juvs. Both juvs and the adults are still spending a lot of time perched on St George’s, and there’s usually at least bird visible. The juvs are starting to roam away from the church a bit and are exercising their wings, becoming increasingly confident at flying, and at landing! The adults are still bringing food into the church occasionally, and there’s a good deal of calling between the adults and juvs. 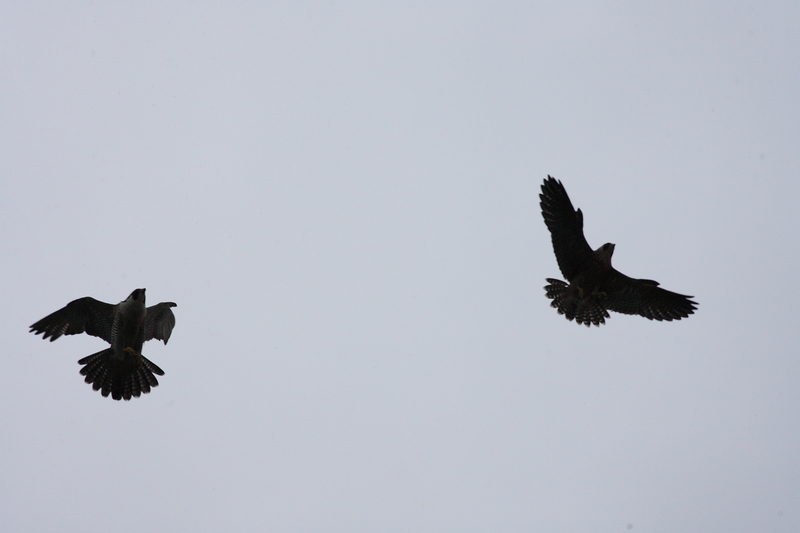 The juvs are still some way off being able to feed themselves, but there was excitement this afternoon as both adults shot off – unsuccessfully – after a Woodpigeon that flew past the tower. There was also some aerial interaction between the adults and one of the juvs, with three birds in the air together giving great views. 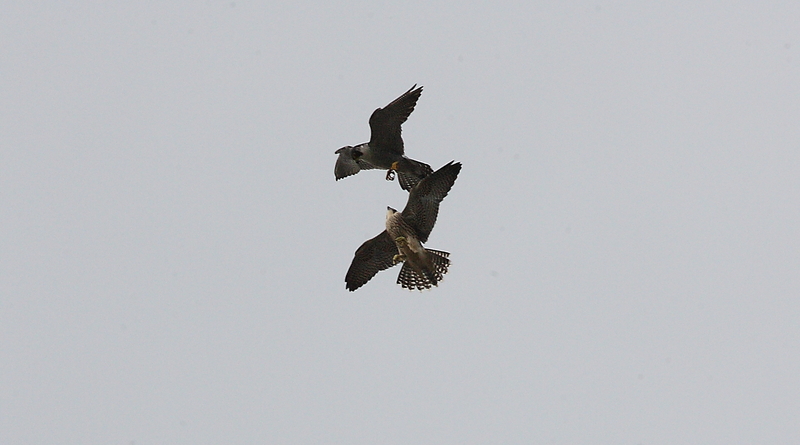 It seemed that one of the juvs was having some hunting lessons, a wonderful spectacle to witness over urban Sheffield. Fingers crossed they continue to base themselves around St George’s for a couple more weeks and that plenty of people can enjoy them in the meantime! 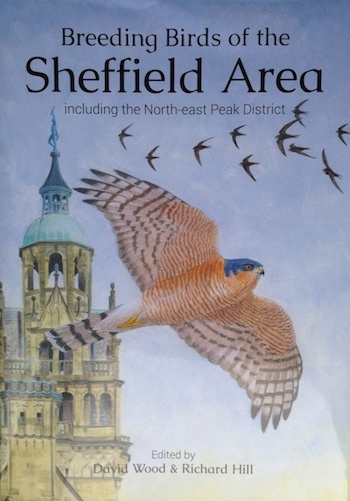 Sheffield’s Peregrines are making the news, and causing much interest in the City. They have featured on BBC’s Look North, and their progress is being reported in the Sheffield Star, with a story on the female chick’s maiden flight here. 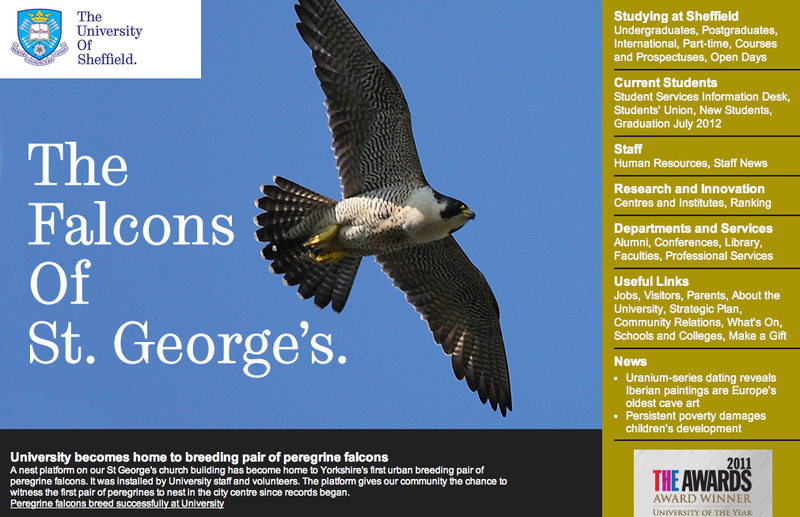 Meanwhile, the University of Sheffield, who own St George’s Church where the Peregrines are making their home, have put the Peregrines as the current University homepage, as seen below. 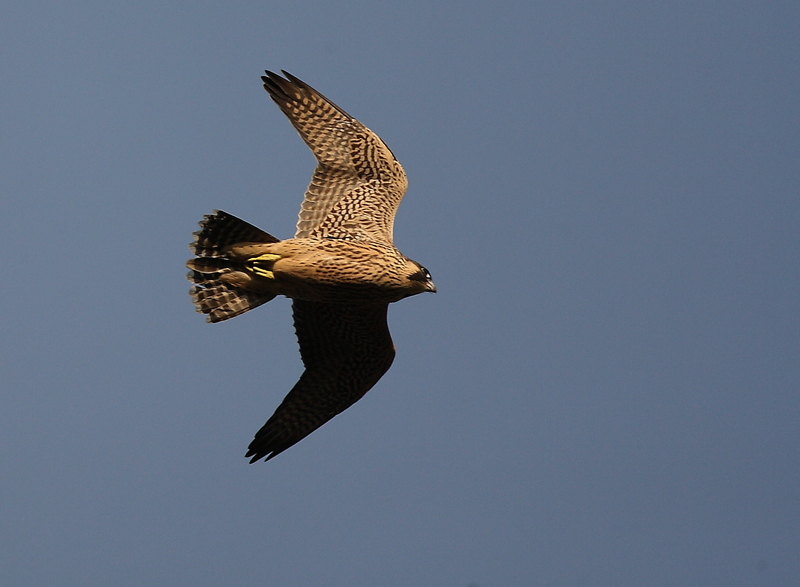 If anyone sees any press reports of the Peregrines that you think we may have missed, then please let us know by commenting on any blog post. 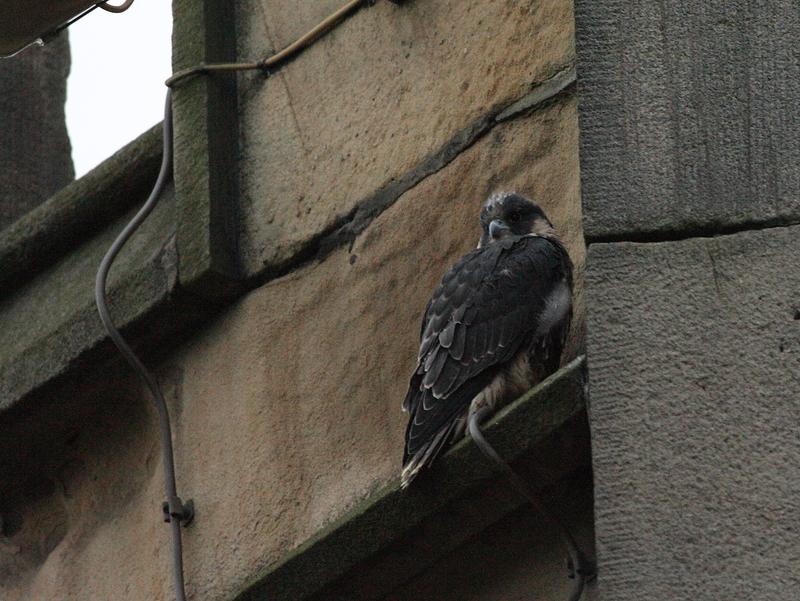 After spending most of the day on the lowest ledge of the church, following yesterday’s trip to the trees, the young female flew to the roof of the old Jessop Hospital buildings, where the adult female took food to her. 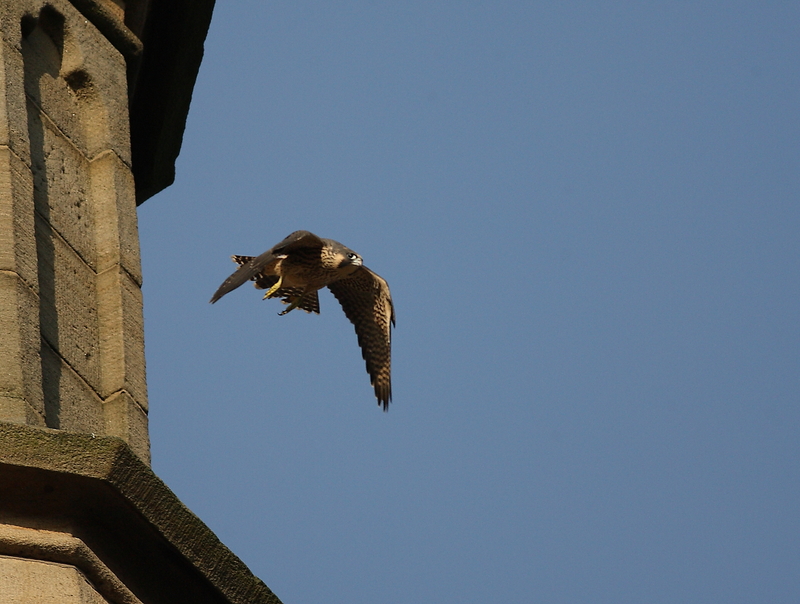 A little later the young female flew back up to the top of the church tower and landed safely on one of the turrets. The SBSG watch this evening from 6-8 provided great views through the telescopes of adults and juvs, both of which have now left the nest platform. 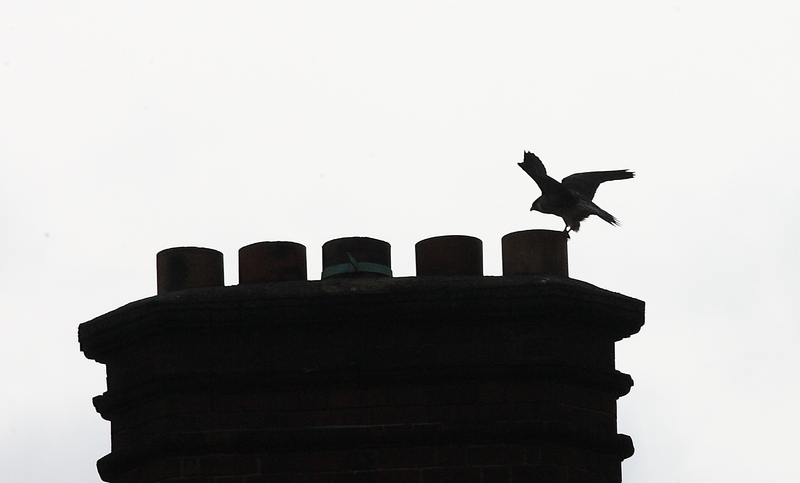 The highlights of the evening were the adult female bringing a feral pigeon in to feed the young female, and the young male taking its first serious flight, circling the tower a couple of times before landing on top of one of the spires and continuing to exercise its wings. A subsequent flight took the young male away from the church a little further, to be ‘escorted’ back by the adult male. 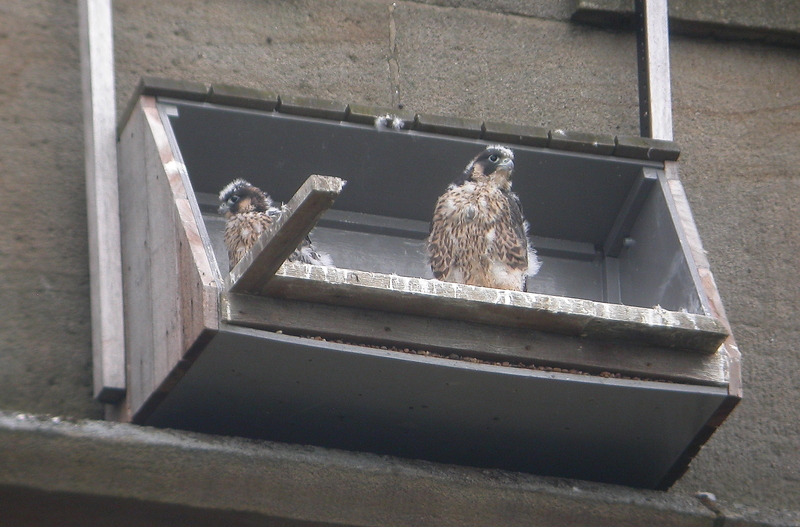 With both juvs securely on the ledges and perches around the top of the church, having negotiated their first flights, one of the key moments in their development has safely passed. Things are looking good! Tues 12th June – D-Day! With ‘D’ being Disaster – almost!! As the chicks have been exercising their wings more and more, and getting on top of the nestbox on Monday, the first flight has been imminent, all tying in with the normal fledging time we’d calculated from when we thought the eggs had been laid. On a quick check on my way into work I bumped into Vic Gibson set up to watch what he felt would be the day the chicks took their first flight, and he was to be proved right! At lunchtime I had a call from staff in our office to tell me that one of the chicks had flown, but that things had not gone to plan… I hot-footed it to St George’s to find a small crowd gathered at the foot of one of the trees by the church. Among them was Jim Lonsdale from the Dept of Estates, who’s led on the construction and siting of the nest platform and dedicated many hours to the successful outcome of the Peregrine Project. He was worried… The female chick had taken its maiden flight, headed downwards and landed in a tree. From there it had tried to fly back up to the nest area, failed to land and flown/ dropped back down to another tree, ending up only about 4-5 metres from the ground. To make matters worse, it was being severely mobbed by a couple of Magpies, one of which was pulling as its tail feathers while the other stayed in front of the head. Look North then arrived, just in time to film some great shots of the birds, which are becoming quite the local celebrities. The Magpies were successfully dispersed with some help from the Estates team, and the young Peregrine moved out towards the end of the branches. Unfortunately the only way to take flight from the position it was in would take it out over Broad Lane, and with confidence in its ability to fly shaky at best there was considerable concern that it could end up on the road, or on the front of a passing car. 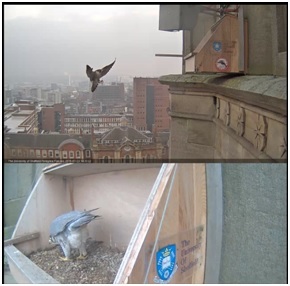 A call to Nick Dixon, a national expert on urban Peregrines, confirmed that it was best to leave things as they were, not try to intervene, and hope the young bird would find its way to a better perch. After several hours it eventually flew out of the tree and made it back onto the lowest ledge of the church, much to the relief of all present. 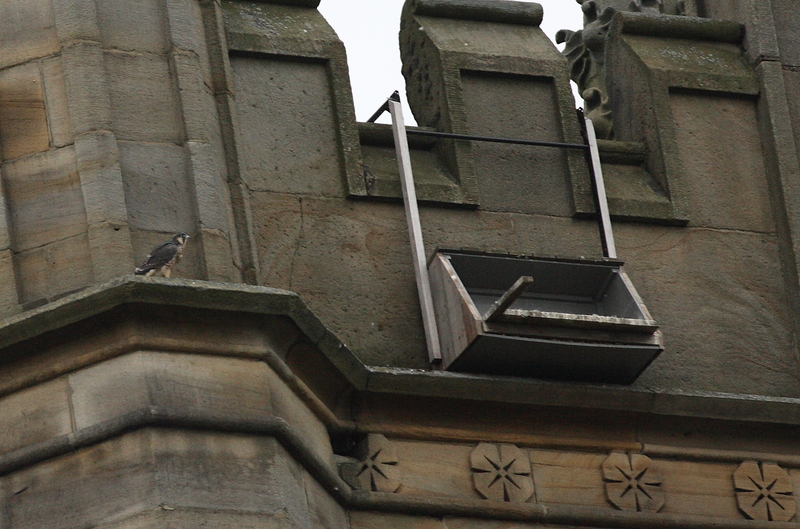 Meanwhile, the male chick continued to exercise his wings, and at about 8 p.m. took his first flight, which carried him all of a metre across to the ledge that runs around the top of the tower. The adult male flew in with food shortly after this, and after failing to encourage the chick to fly across to him, delivered dinner onto the ledge. Over the next half hour, the chick shuffled all of the way around the ledge, and back again, ending up perched by the nest platform. What will tomorrow hold? Some exciting sights, to be sure! The bird on top looked a little smaller (not just because it was a bit further away! ); could the chicks be a male and female or could this just be a difference in hatching dates and/ or subsequent feeding and development? 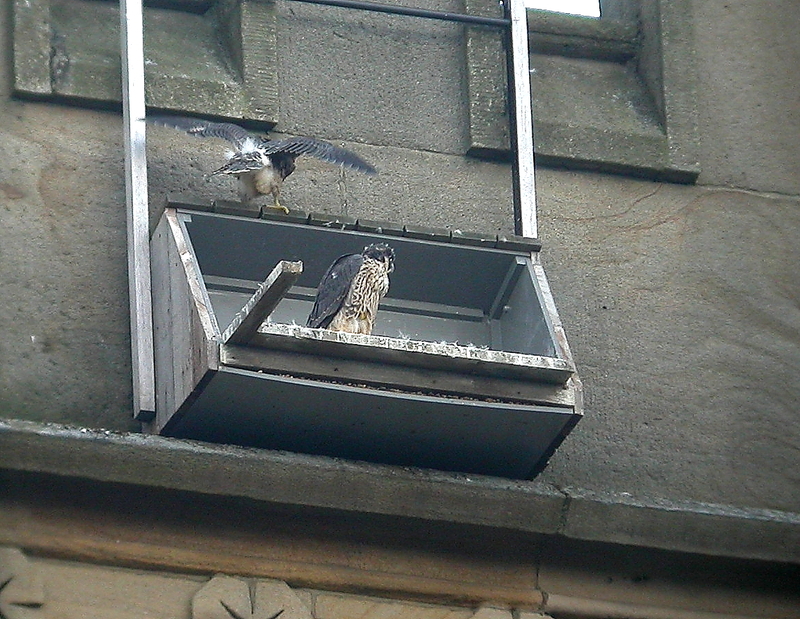 The adult female was on top of one of the ‘spires’ but later flew off and perched on top of the Arts Tower – a favourite vantage point. A quick look this evening ahead of the moorland fringe walk brought, as usual, interest from passersby who are well aware of the Peregrines, and a chance to offer some great views of adults and chicks alike through a telescope. As a bonus, the light was good enough to get some digiscoped images of the chicks, even if a bit distant. Despite the report of 4 chicks, I’ve yet to see more than 2, but that’s a pretty good return for first-time breeders. The chicks continue to be taking plenty of exercise, flapping their wings on a regular basis when they come towards the front of the platform. As they flap you can see the downy ‘chick’ feathers floating away and they’re rapidly looking more and more like their parents in terms of plumage. Over the last two days there’s a surprisingly obvious change in their appearance, as evident in the photo below. How long now until they feel ready to fly?